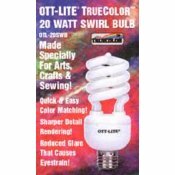 Ott-Lite 20W Swirl bulb that twists into any standard lamp. Bulbs last 10,000 hours and replace 75W to 100W incandescent bulbs. Sold separately the 20 W Swirl makes a great Gift.